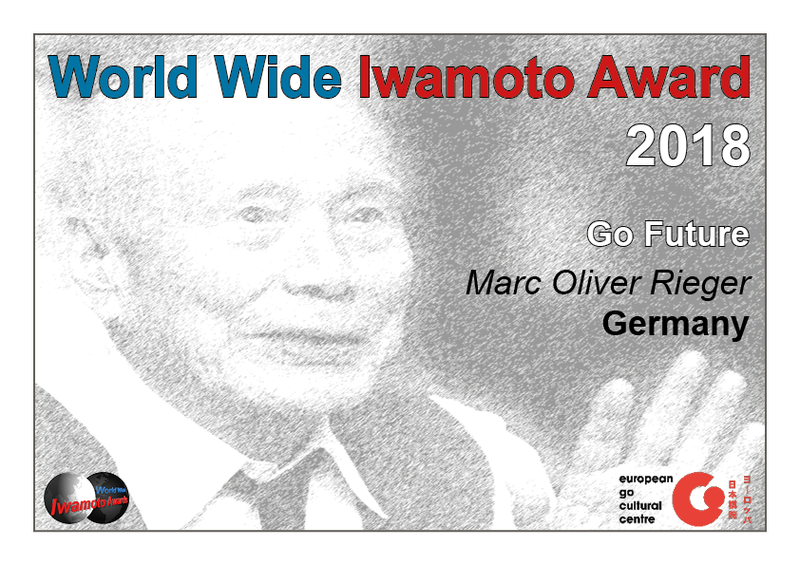 We are proud to present the three winners of the 2018 Worldwide Iwamoto Awards, decided through a point-system by our independent Jury panel of eight go connaisseurs from all over the world. 1 (€ 1000): "Go Future" by Marc Oliver Rieger (from Germany). 2 (€ 500): "Leela Zero" by Gian-Carlo Pascutto (from Belgium). 3 (€ 500): "Go Game in Every Math Classroom" by Xinming Simon Guo (from the USA). During the opening ceremony of the European Go Congress in Pisa, the results were officially presented. 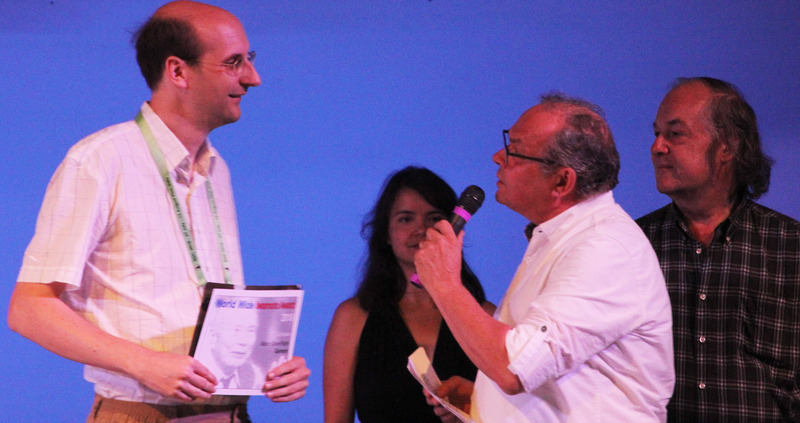 Marc Oliver Rieger was present and pleasantly surprised to have won first prize. Gian-Carlo Pascutto and Xinming Simon Guo were unfortunately unable to attend the ceremony, but arranged for respectively Manja and Vivian to collect second and third prize in their names. We would like to thank all participants for their hard work and their wonderful, creative and surprising initiatives for the game of Go. We hope you all continue your efforts and that you will compete in the Iwamoto Awards again in the future! Below two pictures from the official announcement in Pisa and the final scores of all projects by the Jury. More pictures can be found on our Facebook page. Harry van der Krogt, general manager of the EGCC, congratulates first prize winner Marc Oliver Rieger. Photo by EuroGoTV. 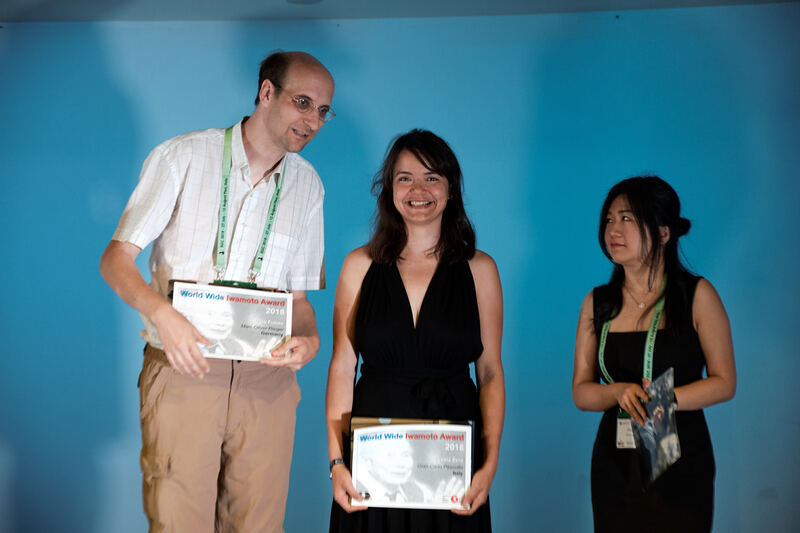 First prize winner Marc Oliver Rieger (left), Manja Marz (middle) accepted second prize in name of Gian-Carlo Pascuto from Belgium, Xinming Simon Guo's colleague Vivian (right) from the USA collected the prize for third place.